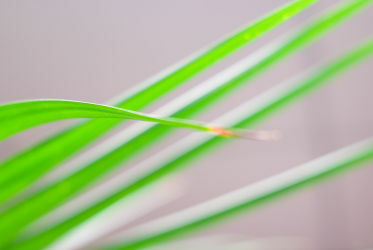 I was messing around with my camera before I left the office Friday and took this shot of a plant. I didn't have any purpose for it at the time, but after looking at it in the computer later I decided it would make a nice background image. A little Photoshop resizing and cropping later and there it was gracing the screen of my laptop. I used to be all over desktop wallpaper. If you look back at old screenshots of mine you see all kinds of fanciful imagery. But somehow that changed. The desktop on my computer at work is still the Apple default, as was my laptop's until just today. Occasionally, though, someone links to that URL instead of using the permanent link for the post (which, using this example, would be '/blog/2475'). That works fine while while the post is on the front page, but after a few more posts go up that content is no longer anywhere to be found. Thursday LA Observed linked to a post using the # syntax. In light of that, I was a little cautious about when I let the linked post fall out of the first five. Today, though, I had something new ready to go and needed a solution. I took this shot last night from Elysian Park. Turns out it's got a comet in it. If you click for the larger view you'll see a diagonal white highlight in the upper right part of the image. 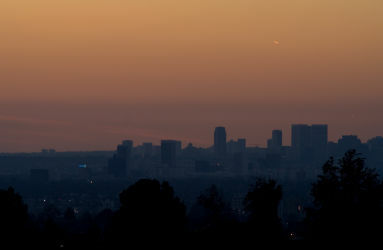 I'm pretty sure that's Comet McNaught, which has been visible here in LA for the past few days. I didn't notice that at all when I took the shot. Another one of those things where you get back to the computer and say, "Wait a minute..."
I got another lens yesterday. Well, actually I got two, but one was just because it was really cheap. 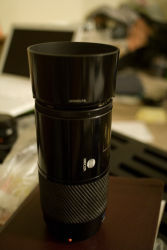 The one I'm particularly excited about is the Minolta 70-210 f4, known in Minolta circles as the "Beercan" (pictured). Set on the A100 (or any other APS-C sensor), the lens is effectively a 105-315mm. For Christmas I had asked for either this lens or the 50/1.7 I ended up getting. I love that I got the fast 50mm for while I was home, since it allowed some very cool indoor portrait shots, but it did leave my long end pretty short (the kit lens, at 70mm, was longest). When I saw this beercan for a particularly good price on KEH I went ahead and picked it up. From playing around inside the apartment last night I'm very happy with it. Tomorrow I'll have to go walk around and take some real shots with it. At the same time I also picked up a Sigma 24 f2.8 for $35 or so. Is it a great lens? Not particularly. It's loud and the focus isn't as smooth as you'd like. In the end, though, it's absolutely worth the $35 to have it around and available. It took the picture of the beercan above. Now I need a bigger camera bag.